One of the wonders of the modern computer is its modular nature. And at times like this, when money may be tight, it's more tempting than ever to open up your PC's case and effect an easy upgrade instead of spending much, much more on a new system. Some extra memory will improve your machine's ability to multitask, while a faster hard drive will enhance file writing. The proposition changes a little if your system is a laptop – but it needn't. Your notebook computer is in many ways just as easy to upgrade as your desktop. All it takes is a little more preparation. Here we pass on the tips that we've learned from cracking open the shells of numerous notebook computers, from picking the best tools for the job to finding the right guide to help you do things properly. Upgrading a laptop is very different to upgrading a desktop PC. Whip off the case of a standard tower and the motherboard is instantly exposed, with the slots, CPU and drive all easily accessible. In a notebook, the components are crammed into a much smaller space and are often layered on top of each other. Some forward-thinking manufacturers design their machines to provide easy access to the parts that are most likely to be upgraded. On the back of a Toshiba Satellite Pro, for example, you'll find cutaway hatches for accessing the RAM, Wi-Fi card slots and the hard disk. Other machines hide their wares, requiring you to remove the keyboard and sometimes even other components before you can get at a part to upgrade it. There are three good reasons for upgrading your laptop. The first, and most important, is cost. You can easily eke out the effective life of a laptop with a cheap upgrade or two. Another reason for cracking open your laptop case is to make repairs. Notebooks are prone to drops and knocks; components can come loose and elements with moving parts are easily broken. You'll save yourself a bundle in labour costs if you're confident enough to replace an ailing optical drive or sticky keyboard. Our third reason for carrying out some DIY upgrades is to make your notebook a better, stronger and faster device. 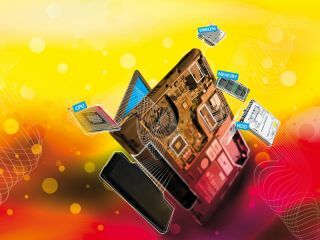 Adding the latest Wi-Fi card or a solid state drive to speed up data access could transform your notebook from a mobile standby into an effective desktop replacement. It's important to begin with the right tools. While modern desktop cases are held together with quick-release catches, you'll need at least a small Philips screwdriver to tackle a laptop case. A cheap, basic set of electrical screwdrivers should be fine, although in some cases we've had to resort to a powered screwdriver to loosen tightly fitted screws. Some laptops – notably Dell and Apple notebook computers – have Torx screws to deal with, which have a star-shaped slot at the top. It might well be worth investing in a set of screwdrivers for those as well. You shouldn't have to pay more than £4, and they'll come in handy for small hex socket screws too. In rare instances you may need a soldering iron, but only to repair any damage you've wrought by being over-eager with your modifications. You'll find all the tools that we've mentioned here in your local DIY shop or online at www.amazon.co.uk/tools. These are standard tools, but we've found that a couple of other bits and pieces come in handy too. A telescopic magnetic pick-up tool can be useful for grabbing small screws that have fallen down cracks: Silverline do one for around £2. A pair of pincers or tweezers will help you when removing small ribbon cables or motherboard connectors. You'll also find that many laptop cases click together with plastic clips. A plastic putty spreader is often the right size to get between gaps and strong enough to give you some leverage without causing too much scratch damage to the exterior case. Of course, you'll only need something like this if you're planning on fully disassembling your machine – and hopefully it won't come to that. No laptop model is the same as another. You can expect notebooks in the same family to be broadly similar, but it's never guaranteed that all the screws are in the same place, or that the hard drive always slots into a handy bay on the side. Sometimes you have to remove the keyboard to get to a screw, or take off the back to access the hard drive. Before you start, flip over your machine and take a good look at the bays and ports on the back and sides. If it's not clear how to easily access a component, don't go blundering in: read the manual first. Some laptop manufacturers provide service manuals online, including Dell and HP. Websites dedicated to 'take-apart' guides – documents created by enthusiasts that detail disassembly procedures – are also helpful. If you have a Toshiba laptop, try www.irisvista.com. MacBook owners are well served by iFixit. The largest repository of guides we've found is Repair4Laptop, which hosts a list of guides for laptops from around 100 manufacturers. If none of these sources comes up with the goods, try 9 Manuals. Here you'll find a splendid set of official service guides in PDF format that you can download for $5.99. The main difference between a service manual and a take-apart guide is that the former will give you a full, official overview of the components in your machine. That's important when considering upgrades. An official guide should answer all sorts of questions, like what kind of memory you need, if there are any spare USB or PCIe ports in the machine and whether the optical drive is of a standard size. If you don't have access to a full service manual, you can interrogate your notebook's architecture using free software tools. We recommend System Information for Windows, a freeware program that interrogates your computer and digs out valuable hardware and software information. It can tell you what drives you have installed and what the interfaces are, what kind of RAM is present and more. You can even use it to retrieve software licenses and passwords, which will come in handy for your pre-upgrade back-up routine. A similar program, PC Wizard 2008, is also free. It supplies you with sufficient data to attempt upgrades, though in less detail and with no software information. It also includes a handy benchmarking tool, so you can measure any improvements in performance after you've upgraded. Some guides recommend a BIOS update before upgrading. We think that's only really necessary in two specific circumstances: if your machine is having problems that diagnostic tests suggest are BIOS related, or if you want to install components that your current BIOS won't support. We say this because flashing your BIOS is a procedure that can turn your laptop into an unbootable brick if done badly. It's also trickier to carry out on notebooks than on desktop PCs, because most lack a floppy drive. One way around this is to boot into Windows using an old install disc and then access the BIOS upgrade – available from your motherboard manufacturer – from a CD-RW. Alternatively, and more safely, try www.bootdisk.com for DOS and Windows boot discs, including a bespoke 'Flash CD' with BIOS upgrade instructions. See the visual walkthroughs in an e-version of the original article on the PC Plus website.